Fluid flow is often counter-intuitive. ANSYS CFD solutions enable you to successfully simulate fluid behaviour, including complex interactions between multiple physics, to optimise your products and processes before prototyping. What's New in ANSYS 2019 R1? 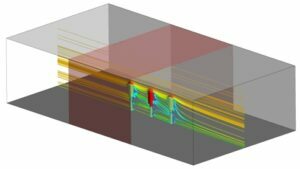 ANSYS offers a comprehensive fluid dynamics solution for modeling fluid flow and other related physical phenomena, including both general purpose software and focused products to address specific industry applications. Unparalleled CFD capabilities from the CFX and FLUENT solvers, integrated within the ANSYS Workbench framework, enable you to design and optimise new fluid-related equipment and troubleshoot existing installations. Viscous and turbulent, internal and external flows can be calculated with ease, with an industry-leading set of turbulence models that can be extended to flow-induced noise predictions. Bi-directional connections with all popular CAD systems enable seamless geometry import, automatic parametric studies and optimisation. The speed of ANSYS CFD simulations can be minimised through highly efficient parallel processing capabilities to exploit multiple core PCs and High Performance Computing (HPC). Combined with ANSYS Structural Mechanics or Electromagnetics solvers, ANSYS CFD software can undertake fluid-structure interaction (FSI) and other multiphysics simulations. 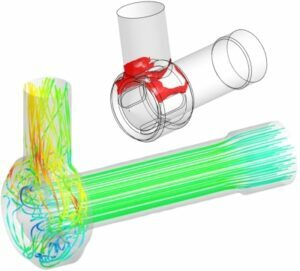 ANSYS develops the most comprehensive set of fluid dynamics simulation tools available for product and process design, development and research. With a common workflow and user environment, you can easily upgrade between appropriate solutions as your requirements evolve. ANSYS CFD Enterprise includes all the computational fluid dynamics solvers that ANSYS has to offer, including Fluent, CFX, Polyflow, Forte and FENSAP-ICE, together with productivity modules such as ANSYS DesignXplorer, Simplorer Entry and ACT. For simulation-led design exploration, it also provides access to AIM structural, fluid dynamics and electromagnetic capabilities. 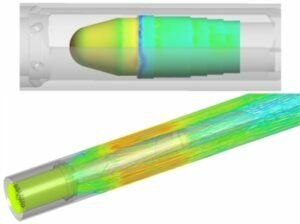 ANSYS CFD Premium comprises a comprehensive suite of fluid capabilities for the fastest, most accurate results across any fluid or multiphysics application, including Fluent and CFX solvers. ANSYS SpaceClaim is included with all ANSYS CFD products for rapid geometry building, editing, defeaturing and modifying. ANSYS Discovery AIM is an integrated multiphysics solution for designer-focused simulation, including structural, fluid dynamics and electromagnetics capabilities. ANSYS Icepak provides CFD simulation for electronics cooling applications. ANSYS Polyflow simulates a range of manufacturing processes, such as extrusion and blow moulding, within the plastics, glass, metals and cement processing industries. ANSYS Chemkin-Pro models complex gas phase and surface chemistry reactions for fast, accurate development of combustion systems. ANSYS Forte predicts IC engine combustion performance with nearly any fuel, helping engineers rapidly design cleaner burning, high-efficiency, fuel-flexible engines. ANSYS FENSAP-ICE is the premier in-flight icing simulation system, used worldwide by major aerospace companies. Turbomachinery-specific geometry and meshing tools assist CFD simulation of rotating machinery, including ANSYS VistaTF, ANSYS BladeModeler and ANSYS TurboGrid. ANSYS 2019 R1 introduces the new Fluent experience. Along with a new look and task-based workflows, you will appreciate the enhanced speed and simplicity of this single-window way to run computational fluid dynamics simulations in ANSYS Fluent. GEKO lets you control turbulence. This revolutionary concept allows you to tailor turbulence models to their applications. GEKO provides free and tunable parameters that can be adjusted over a wide range, to match the simulation to specific physical effects while maintaining the underlying calibration. Finally, you can now easily leverage cloud computing to speed your simulations by submitting jobs directly from their Fluent desktop. Fluent software contains the broad, physical modelling capabilities needed to model flow, turbulence, heat transfer and reactions for industrial applications. These range from air flow over an aircraft wing to combustion in a furnace, from bubble columns to oil platforms, from blood flow to semiconductor manufacturing and from clean room design to wastewater treatment plants. Fluent spans an expansive range, including special models, with capabilities to model in-cylinder combustion, aero-acoustics, turbomachinery and multiphase systems. Fluent also offers highly scalable, high-performance computing (HPC) to help solve complex, large-model computational fluid dynamics (CFD) simulations quickly and cost-effectively. Fluent set a world supercomputing record by scaling to 172,000 cores. Fluent already solves the toughest design challenges with well-validated results across the widest range of CFD and multiphysics applications. But today, engineers need to accomplish more, in less time and with less training than ever before. Introducing the New Fluent Experience, a whole new way to enjoy CFD simulations. Fluent has a new look that’s easy on the eyes. Users can pick from several themes or chose the new, Japanese language localisation. Fluent’s task-based workflow guides users through an organised simulation process that offers the most accurate results in less time. At each step in the process, the software provides the most relevant design options or defaults to a best-practice option. Benchmark data show that users complete the workflow with 70 percent fewer clicks and 50 percent less hands-on time. Fluent meshing now includes a unique patent-pending technology that delivers higher quality results at faster speeds. This Mosaic meshing technology uses a high-quality boundary layer mesh to automatically combine a variety of boundary layer meshes, for fast and accurate flow resolution. In a benchmark simulation of a Formula One wing, the Mosaic mesh had fewer, better quality cells, required 34 percent less memory and achieved a 47 percent faster solve time. Thoughtful changes permeate every screen, every step, making simulation a joy. Users will encounter fewer clicks, simplified data entry, enabled drag and drop, embedded smart interactions and more. An educational tool ANSYS is and will be an excellent teaching tool for all engineering disciplines. Looking at my own industrial background I would personally recommend all engineering companies I have worked with, and for, to invest in this software and the training packages. Excellent training provider in ANSYS CFD modelling with in-depth experience and expertise. ... Our improved in-house capability has speeded up our development schedules & helps us to progress our designs & testing much faster, with lead time reductions of around 80%...We see Wilde as a key partner in the development of our skills & software capability. Technical support gave timely well informed help with the problem that I faced, including recommendations for tackling similar situations more effectively in the future.